Today I found out why your palms get sweaty when you’re nervous. Ever been on the edge of a cliff or looking out the window at the top of a skyscraper and your hands start to sweat? Or maybe it’s when you’re about to speak in front of an audience? The individual who introduced you might shake your hand and hope you didn’t just come from the bathroom because your palms are more saturated than a sponge in water. So what’s going on here? 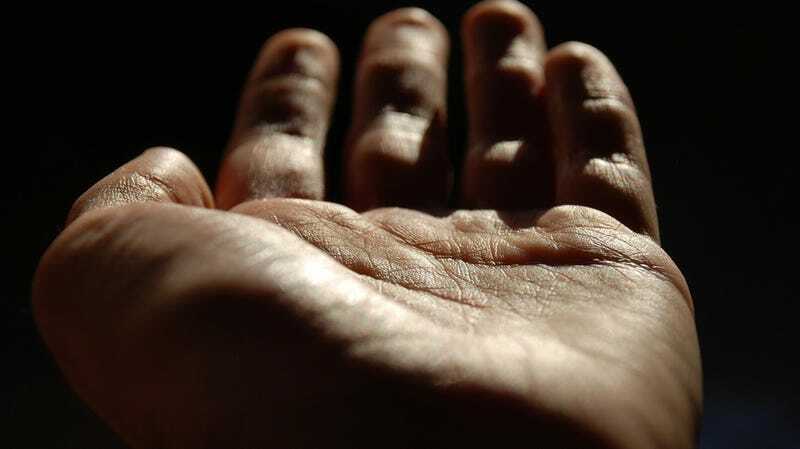 Medically, the condition of having excessively sweaty palms is known as “Palmar Hyperhidrosis”. In general, it can be caused by two different things- emotional stress and the result of your body trying to control its temperature (thermoregulation). In the case of being excited, scared, or nervous, the cause is stimulation of a specific type of sweat gland from your fight or flight (sympathetic) nervous system. To understand why, let’s talk about the different types of sweat glands and what causes all that moisture. We have three types of sweat glands, Eccrine, Apocrine and Apoeccrine. While the three types can produce sweat because of the same action, like running on a treadmill, it’s important to note the difference to understand why your palms sweat when you’re standing on the edge of a bungee jump platform. Eccrine glands make up most of the sweat glands you have. Depending on which study you want to go with, approximately 3 million of the nearly 4 million sweat glands are Eccrine. Their main function is to control body temperature. Areas of the body that have the highest concentration of Eccrine glands are the soles of the feet, palms of the hands, and the forehead. These are the sweat glands responsible for your sweaty palms. When they’re stimulated, they release a clear odorless fluid that evaporates into the air, thereby cooling you off when your body temperature gets too high. Apocrine Sweat glands primarily reside in your armpits and your genital regions. They produce a thicker, oily, odorless, fluid that gets released into your hair follicles. Bacteria that reside on your skin break down this fluid and the result is the odor we smell when we don’t shower regularly. In mammals, this oily fluid is thought by some to act as a pheromone to attract a mate, or act as a warning signal to other mammals. Apoeccrine glands also primarily reside in the armpits and genital regions. They develop during puberty from what are known as Eccrine precursors, and can produce sweat up to seven times faster than Eccrine glands. The role of these types of glands is controversial, but it’s thought to be involved in the excessive sweating of people with a condition known as Axillary Hyperhidrosis (excessive armpit sweating). All your sweat glands are activated by a type of nerve fiber called a sympathetic fiber. These are the nerves that react to your sympathetic nervous system. When this fight or flight system becomes active, you sweat. When you’re running, biking, swimming, or generally putting your body in a situation where it needs to cool itself down, it releases neurotransmitters like dopamine, epinephrine, and norepinephrine, that cause your sweat glands to leak like a bad faucet. The main neurotransmitter responsible for stimulating the Eccrine glands in your palms is Acetylcholine. So why do your palms get sweaty when you’re excited or stressed? When the Eccrine glands in your palms are stimulated by your sympathetic nervous system to control temperature, they get that signal from an area of the brain called your hypothalamus. On the other hand (pun intended), when we get excited, the areas of the brain that signal comes from are called your neocortex and limbic centers. Since these regions are fairly large, the exact centers aren’t currently known, but it’s thought they come from areas called your amygdala, prefrontal cortex, insular cortex and cingulum. You might be asking yourself, “Why does it matter which area of the brain this signal comes from?” It’s this answer that’s the reason why your palms get sweaty when you’re standing on the edge of a cliff. When emotional stress causes a reaction from your sympathetic nervous system, it primarily affects the Eccrine glands on your face, palms, soles of your feet, and in your armpits. It also causes your veins to constrict. This is a significant distinction from when your hypothalamus causes the reaction- in that case, your veins get larger (dilate). This helps get all of the blood near the surface of your skin to help cool you off. It’s very important to note, however, emotional sweating and thermoregulatory sweating aren’t necessarily distinct from one another. They have been shown to influence each other. The difference is very real, though. For instance, emotional sweating has been shown to be unresponsive to temperature changes, thus not affected by your hypothalamus. The result is, you get excited, but don’t need to be cooled off- your Eccrine glands get stimulated by your sympathetic nervous system from an area of the brain that doesn’t necessarily affect cooling. Armed with this knowledge, you might be asking yourself why Mother Nature and evolution created such a seemingly complex system that seems to have the same result, sweaty palms. You wouldn’t be the first to ask this question. The exact reason why this is, though, is still very controversial. The prevailing theory is that this is a very efficient way to cause several reactions using the same pathways and glands. The emotional sweating causes sweaty palms that can help control the humidity of the outer layer of the skin. This could improve the friction on the skin thereby helping when you begin to sense you will be hunting an animal, fighting enemies, or about to climb a cliff. The generalized sweating that results from your hypothalamus then helps cool the body when these intense physical activities are happening. It also produces an odor that sends out pheromone signals to those same enemies/animals. The pheromones also could help signal potential mates that you are natural selection’s answer to their mating needs. In the end, stand on the edge of a cliff and sweat confidently knowing your body is working as it’s supposed to! Just make sure you bring plenty of extra paper towels and avoid hand shaking. While sweaty palms is normal for most, excessive sweating can be irritating and embarrassing. Medically this excessive sweating is known as hyperhidrosis. It’s defined as, sweating beyond what is necessary for thermal equilibrium. About 1.4% , or approximately 4 million Americans are thought to be affected by this disorder. About 1/3 of those say it affects their daily life and is either barely intolerable or simply intolerable. Treatments for this disorder are wide ranging. If the cause is simply emotional, your doctor might prescribe medication to help keep you calm, like Diazepam. Anticholinergic medications can also be prescribe to reduce the affect acetylcholine has on your sweat glands. Topical antiperspirants that contain aluminum salts, such as aluminum chloride can also be administered. Aluminum salts work here because they irritate the sweat glands and cause them to swell. This prevents them from excreting their annoying fluid. Another time tested treatment is to submerge your hands or feet in warm water that has a mild electric current flowing through it. It isn’t currently known why this helps, but after about 5-10 sessions, sufferers begin to see results. Botox injections to the area affected have also shown to be very helpful. Should all of these treatments not work, there is a surgery that can help, known as Sympathetic Nerve Reconstruction. Scott writes for the wildly popular interesting fact website TodayIFoundOut.com. To subscribe to Today I Found Out's "Daily Knowledge" newsletter, click here or like them on Facebook here. You can also check 'em out on YouTube. This post has been republished with permission from TodayIFoundOut.com.